This collection of essays by leading experts in manuscript studies sheds new light on ways to approach medieval texts in their manuscript context. 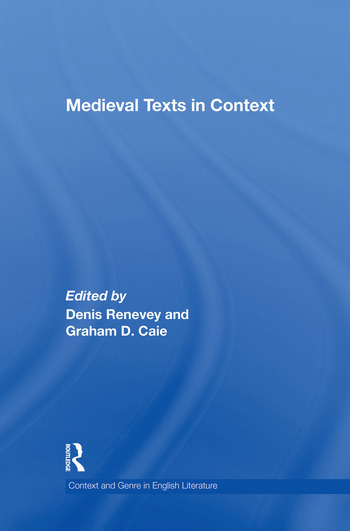 Each contribution provides groundbreaking insight into the field of medieval textual culture, demonstrating the various interconnections between medieval material and literary traditions. The contributors’ work aids reconstruction of the period’s writing practices, as contextual factors surrounding the texts provide clues to the ‘manuscript experience’. Topics such as scribal practice and textual providence, glosses, rubrics, page lay-out, and even page ruling, are addressed in a manner illustrative and suggestive of textual practice of the time, while the volume further considers the interface between the manuscript and early textual communities. Looking at medieval inventories of books no longer extant, and addressing questions such as ownership, reading practices and textual production, Medieval Texts in Context addresses the fundamental interpretative issue of how scribe-editors worked with an eye to their intended audience. An understanding of the world inhabited by the scribal community is made use of to illuminate the rationale behind the manufacture of devotional texts. The combination of approaches to the medieval vernacular manuscript presented in this volume is unique, marking a major, innovative contribution to manuscript studies.